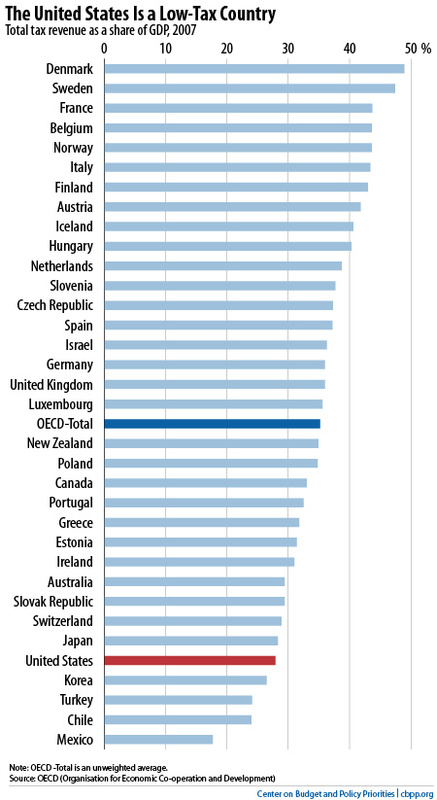 Tax Justice Network: Does the United States have the world's highest tax rates? Does the United States have the world's highest tax rates? You would think so, if you read the output from the Heritage Foundation. Just a couple of weeks ago, the rather anti-tax Heritage Foundation yelled: No Fooling: U.S. Now Has Highest Corporate Tax Rate in the World. "The U.S. rate is well above the 25 percent average of other developed nations in the Organization for Economic Cooperation and Development (OECD). 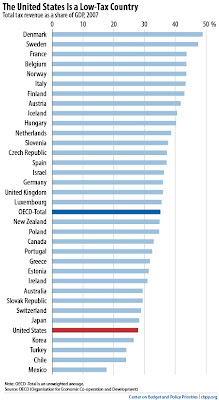 In fact, the U.S. rate is almost 15 percentage points higher than the OECD average. This gaping disparity means every other country that we compete with for new investment is better situated to land that new investment and the jobs that come with it, because the after-tax return from that investment promises to be higher in those lower-taxed nations." "America has one of the lowest corporate income taxes of any developed country, but you wouldn’t know it given the hysteria of corporate lobbying outfits like the Business Roundtable. They say that because Japan lowered its corporate tax rate by a few percentage points on April 1, the U.S. now has the most burdensome corporate tax in the world." Also, on a somewhat different but related subject, this picture, from the Center on Budget and Policy Priorities, is interesting. The United States, at the end of the day, is a low-tax country. Click to enlarge. The answer to the question in our headline is a very short one. It has two letters, it begins with 'n' and ends in 'o.' And it's a resounding one.